All new body and engines. Bigger than the already big 1993-2000 Mondeo, on same but modified CDW27 platform and now a Scorpio-sized 4,731mm (15' 6") long by 1,931mm (6' 4") wide; estate: 4,804mm (15' 9") long. More roomy inside. Better handling from Focus-like 'control blade' rear suspension. 'New Edge' styling. Estate car even bigger inside than E-Class Mercedes. Engine range includes new chain cam 125 bhp 1.8 litre Duratec HE petrol, new chain cam 143 bhp 2.0 litre Duratec HE petrol; 168 bhp 2.5 litre chain cam Duratec V6 and 113 bhp 156g/km CO2 2.0 litre chain-cam 16v direct injected Duratorq diesel engine. The new petrol engines meet Euro 2005 emissions limits from the start; diesels by March 2004. Smallest wheel/tyre combination is 16in with 205/55 R16 tyres, going up to 17in and 18in wheels. UK list prices: £14,595 for 1.8iLX and £15,095 for 2.0iLX both with a/c, alloy wheels, three year warranty and 12 year anti-corrosion warranty. V6 Zetec S launched at £19,095 (note that 10 spoke alloys much better looking than 5 spoke.) 2.0 litre 217bhp 150mph V6 ST220 from May 2002. New 128bhp 2.0 litre chain-cam 16v common rail direct injected TDCi diesel with 243lb ft (329Nm) torque finally arrived in UK from December 2001. Its 0-60 is 9.6 seconds, top speed 124mph, combined economy 47.9mpg and CO2 output 156g/km. Prices start at £16,145 for the four or five door LX. Hot ST220 in 2002 powered by de-tuned 217bhp version of Jaguar Duratec V6. New 5-speed 'Durashift 5-tronic' autobox for V6 and TDCi 130 announced at Brussels Motor Show, priced £1,500 v/s £1,000 for standard 4-speed autobox. 115bhp version of TDCI replaced old TDDI for 2003. And 143bhp 2.0 16v engine made available in Zetec S model. Getrag 6-speed manual box for TDCI 130 from March 2003. 2004 model year available from from July 2003: New 130PS 1.8 Duratec SCi engine is a chain-cam direct injected petrol. Now an excellent 39.2 mpg combined, it qualifies for Euro IV, and CO2 emissions are down to 173g/km qualifying it for £145 VED. 0-60 is 10.2 seconds and top speed 128mph. Cruise control is standard. LX costs £14,900. Six speed gearbox standard on Zetec S.
Duratorq TDCI common-rail diesel also improved, now delivering 0-60 in 9.5 seconds, top speed of 128mph, combined economy of 48.7mpg and CO2 emissions of 154g/km (£135pa VED). Six-speed box is standard. Lifts top speed of the 226PS 3.0 Mondeo ST220 from 151 to 155mph, yet still offers 27.2mpg combined. 115bhp TDCIs and 170bhp 2.5 V6s also get the six-speed box. Lists at £23,100. Has electric folding mirrors. Ford's 5-speed automatic Durashift 5-tronic now comes with optional steering wheel shift control buttons. Inside, car has a new, smarter central console and a wide variety of Sony ICE options including MP3 capability. There is an option of rear seat DVD with individual headphones for two rear seat passengers. 153bhp ST TDCI from May 2004, gets to 60 in 8.4 seconds. Freshened up again from May 2005 with simplified range. LX has new bumpers front and rear, chrome grille surround, better driving characteristics and on 6 speeds a trigger to prevent miss-shifts, plus a ring which needs to be lifted to select reverse. Titanium and Titanium X offered as alternatives to Ghia and Ghia X at same prices. 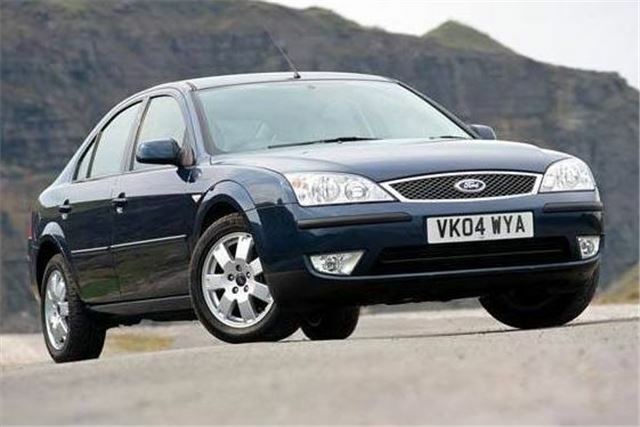 Run-out special Mondeo Edge from February 2006 list prices from £14,995 and always discountged. Based on LX with air-conditioning, rain-sensing wipers, auto-lighting, park-assist rear parking sensors, a driver's seat with electric height adjustment, a leather steering wheel and CD audio system with MP3 connectivity. Also exterior body kit (body colour door handles, lower bumper valances and new mesh radiator grille); Unique 16-inch five-spoke alloy-wheels; "Quickclear" heated front windscreen; Power-operated windows; Front fog lights; Auto dimming rear-view mirror; Silver roof rails (estate models only); Intelligent Protection System (IPS) featuring driver's and front passenger's airbags, side and curtain airbags; Electronic anti-lock brakes (ABS) with Emergency Brake Assist (EBA). £500 premium for an increase in engine power e.g. 1.8-litre to 2.0-litre; a £1,000 increase from petrol to diesel engines and a £1,000 increase between five-door and estate bodystyles. Five new colours have also been added to the entire Mondeo line up: Kelp, Sea Grey, Tango Red, Blue Ambition and White Grape.